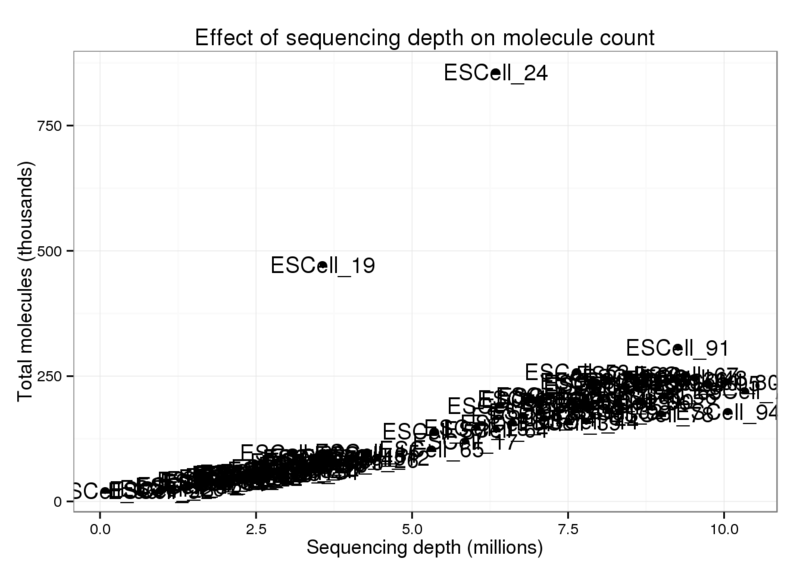 Does the sequencing depth of a given single cell affect the total number of UMIs observed in the data from Islam et al., 2014? The GEO entry for the study GSE46980 contains a tab-delimted file with the molecule counts for all the samples. The samples are labeled by their well, e.g. “A01”, and their barcode, e.g. “ATTAGAC”. I label them from ESCell_1 to ESCell_2 to correspond to the naming scheme of their fastq files. The fastq files only contain the barcode and not the well, e.g. “ESCell_1_ATTAGAC_single”. I did a few spot checks, and it appears that the order of the columns in the molecule counts file corresponds to the 1 through 96 numbering of the fastq files. Supplementary_files_format_and_content: Tab-delimited text file containing counts of detected cDNA molecules for each transcript model in each of the 96 cells, using data from all three sequencing lanes. Next I needed the raw fastq files to obtain the sequencing depth. These have to be downloaded from the Sequence Read Archive (SRA). Unfortunately by design the SRA assigns samples arbitrary IDs making it very difficult to figure out which sample is what. In other words, this is not the fault of the others because this happens to all data posted to SRA. The informative names that are viewable in GEO are stripped in the SRA. Luckily I found a strategy from this Biostars comment to obtain the mapping between each sample in GEO to the sample ID in the SRA. The samples with the label “single” each have two fastq files. The other samples labeled “amplified” were PCR-amplifed for an additional 9 cycles, and each only have one fastq file. All three fastq files were used to obtain the molecule counts (see the description above). The information obtained via GEO maps each sample to its SRA sample ID (SRX). To convert from SRX to the fastq files (SRR), I downloaded the meta-information from SRA. This takes a long time but only has to be done once. For each sample, I download the associated fastq files and give them a meaningful name. I obtain the sequencing depth by counting the number of raw reads in each file. I obtain the total molecule counts per sample by summing the columns. I then merge the total molecules with the total reads, confirming that the sample names are concordant. 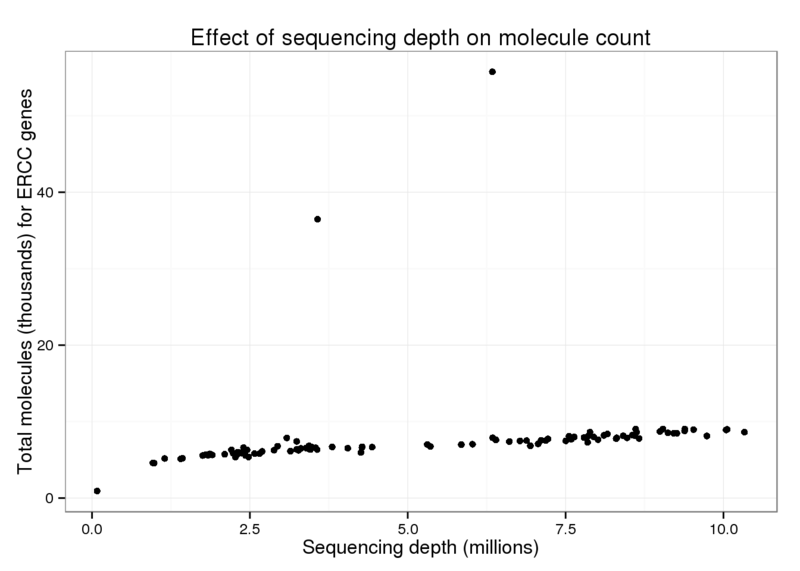 To make the plots more easily interpretable, I scale the total number of molecules by 103 and the total number of reads by 106. 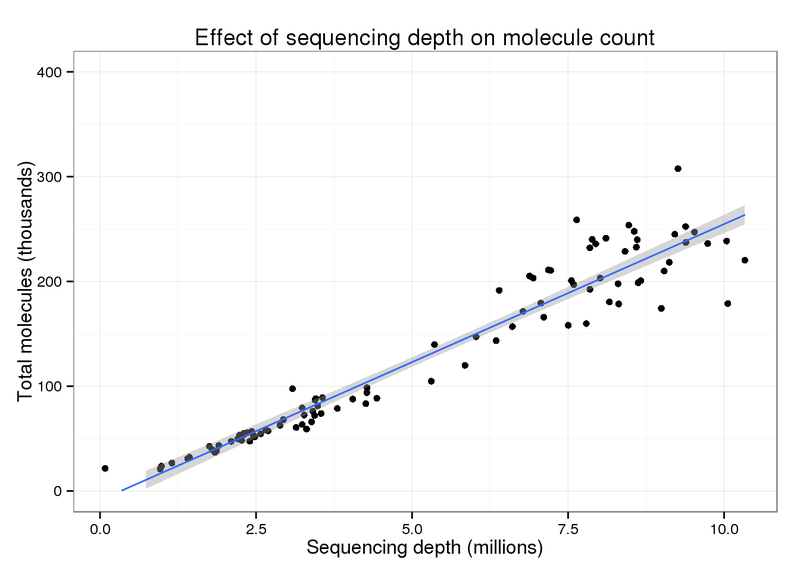 Plotting the sequencing depth versus the total number of molecules per sample. There are two clear outliers: cells 19 and 24. I’m not sure why these two cells are so different. 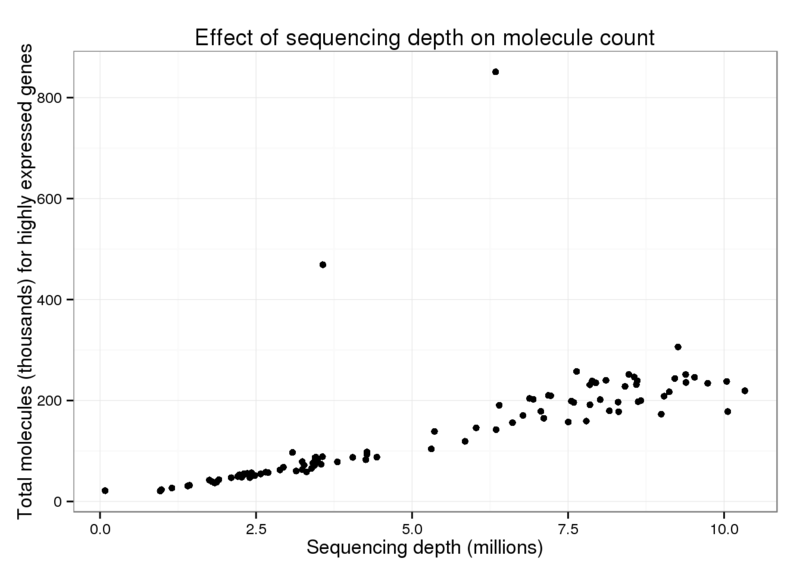 But focusing on the majority of cells, there is a clear increase in the total number of molecules with increasing sequencing depth. Warning: Removed 2 rows containing missing values (geom_path). 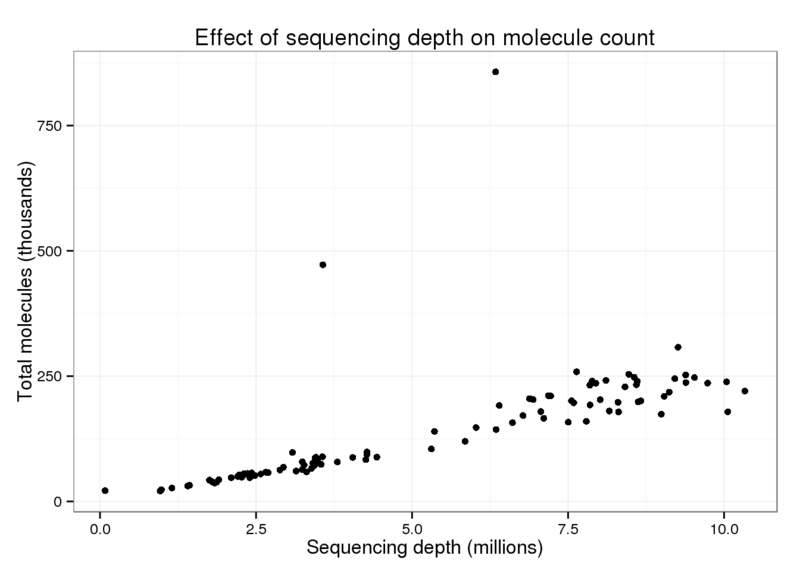 Maybe this effect is only seen when considering all genes (since with more sequencing, you are more likely to sequence rare molecules). 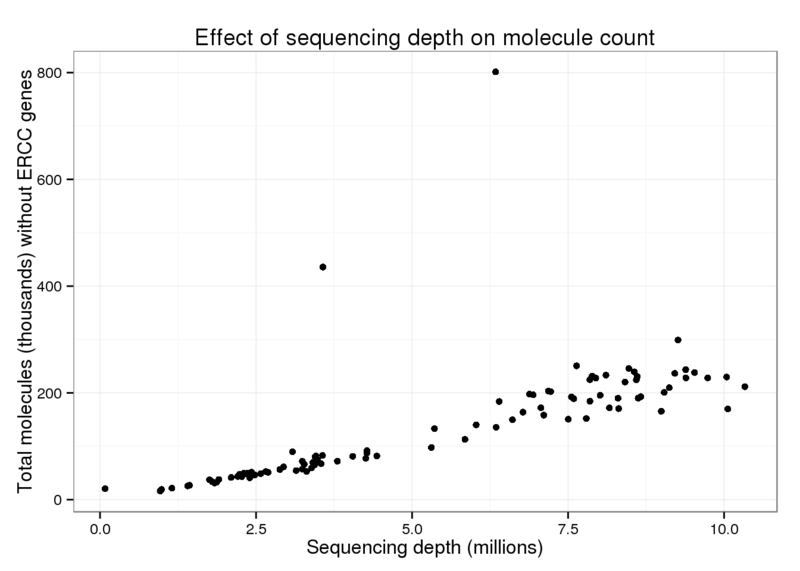 Below I limit the analysis to only the 10,000 most highly expressed genes. The trend appears the same when only using the top expressed genes. Another possibility is that this difference in largely driven by the ERCC spike-in genes. But these also look similar to the overall trend.